Unlike in the Amazon, where the animals are hidden out of view, the Pantanal is positively busting with wildlife. 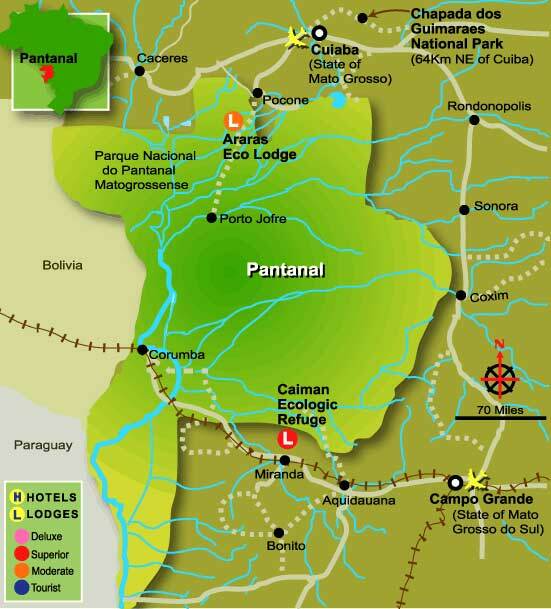 With the biggest concentration of large animals in the New World, the Pantanal counts jaguars, giant otters, anacondas, caimans, hawks, Macaws, Marsh deer, Tapirs, egrets, herons, monkeys, and ibis as a few of its many species of inhabitants. The rain season is from November to the beginning of April. At this time, many areas become flooded; oftentimes roads accessible by car during the dry season now only become accessible by boats. From May to October the water levels slowly diminish, and by the end of October the large lakes become smaller ponds and even puddles. As fish get trapped in these small watering holes, this becomes feasting time for birds as well asfor the eyes of those who have come especially for bird watching.